Wolfgang Amadeus MOZART arr. Ellerby Piano Sonata in A, K.331: 3rd movt - "Rondo alla Turca"
In a letter to Elgar following the première of his Severn Suite for brass band, Bernard Shaw protested that it was useless filling the score with Italian expression marks that coal miners wouldn't understand; what was needed were down-to-earth phrases such as "now, like hell!" or "it's a march, not a bloody minuet!". The Grimethorpe Colliery Band need no such encouragement. All the faster pieces from the now classic soundtrack for Brassed Off have an irrepressible verve, while haunting poetry and tonal shading is found in the Grainger version of the Londonderry Air and the Rodrigo movement. The original music by Trevor Jones has far more substance than you would imagine just by looking at the (mostly) very brief timings and its insertion gives a narrative feel to the whole disc. This is a total product, not just a selection of pieces.
) should hear this. So there are a few near misses alongside the hits and if you are going to cut a movement like the Dvorak (only the outer sections are present) you should at least wipe the blood off - the modulation is horrible. Also, Miss Garrett and the band are frequently not together at all. 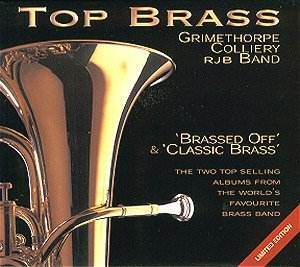 Brassed Off is a great disc which I feel everyone should have, even and especially those who normally don't go in for brass bands. About Classic Brass I'm not quite so sure, but while the offer of the two together lasts, why not?